Green Groups Oppose DC Mayor’s OAG Changes! The DC Environmental Network, Friends of the Earth, Chesapeake Climate Action Network, Global Green USA, Potomac Riverkeeper, Anacostia Riverkeeper, Clean Water Action, Center for Biological Diversity, DC Divest & Global Bees sent a letter to DC Council members today in opposition to Mayor Gray’s proposed changes to the structure of the Office of Attorney General. Click Here to Read Entire Letter! The DC Environmental Network Invites All Metro-Based Environmentalists to Our Monthly Brown-Bag Discussion & Networking Opportunity! 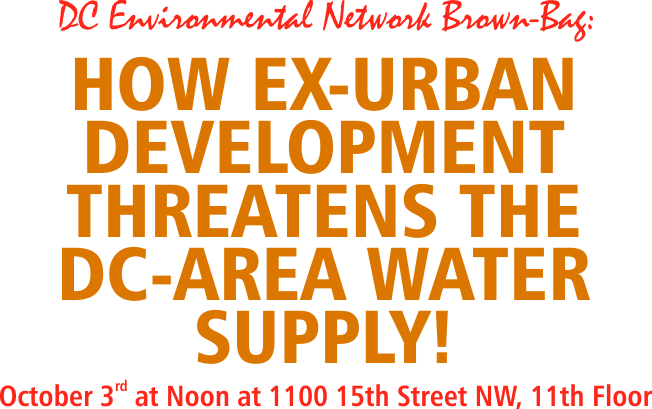 Come hear a distinguished panel of experts discuss the impact of planned large-scale development on the emergency drinking water supply for the DC metro area’s 4.3 million residents. There’s still time to take action to save Ten Mile Creek and the Little Seneca Reservoir – attend this luncheon to see how you can help. Other speakers invited to participate. Update on Friday. Our October 3rd discussion will be held at the offices of the DC Environmental Network, 1100 15th Street NW, 11th Floor. All are welcome. RSVP to this important discussion here. Details: The Montgomery County Planning Board is currently finalizing a plan for development in and around Clarksburg MD that will be sent to the Montgomery County Council for a vote later this fall. The Planning Board says in its own draft that the plan fails to protect the last clean tributary to the region’s emergency drinking water supply – the Little Seneca Reservoir. This reservoir has been used twice in recent years and has been prepared for use another time. In an era of increasing drought cycles the reservoir will become even more critical to the region. 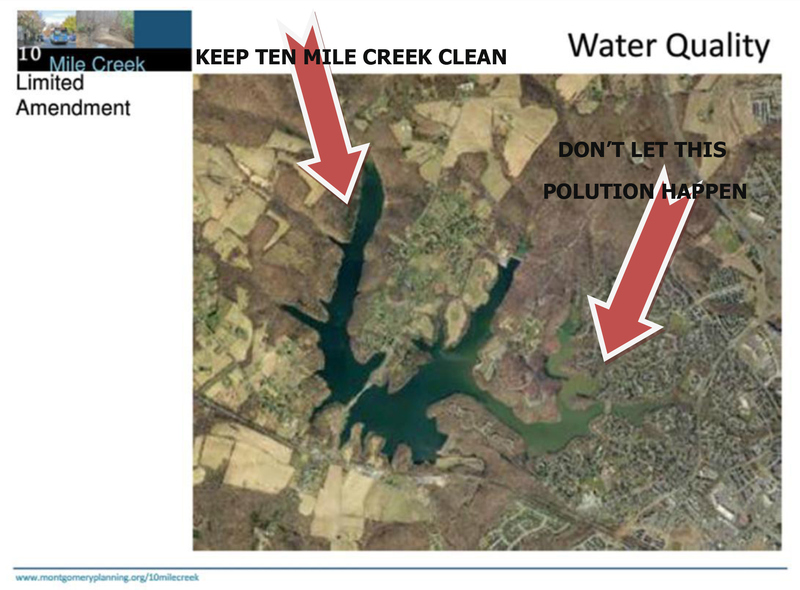 In addition, the degradation of Ten Mile Creek threatens area groundwater – on which nearly 60 percent of northern Montgomery County residents rely. The DC Environmental Network submitted testimony to the Montgomery County Planning Board. Click Here! Find additional information on the Save Ten Mile Creek website. Click Here! Speakers will present about these issues and answer your questions. We will then engage in an open discussion about how we can all work together to protect our region’s water supply. All are welcome. Spread the word. RSVP Here!